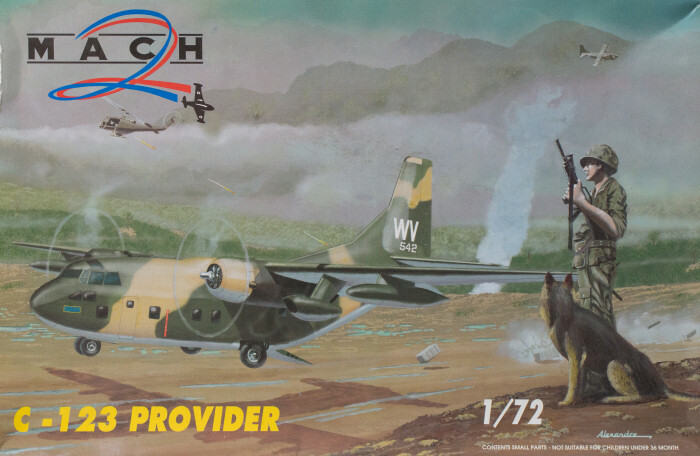 Until recently, this Mach 2 kit was the only injection-molded plastic option for building the C-123 Provider in 1/72 scale. With the release of Roden's 1/72 C-123B kit, that status has changed as the Roden kit is the best kit of the Provider in any scale. Nevertheless, given the current situation in Roden's home of the Ukraine, there are some concerns whether future versions of the C-123 or even continued supplies of the current C-123B kit will be available. For those of us that have purchased the Roden kit but want to render a later version of the aircraft, there is currently but one option, this Mach 2 kit. 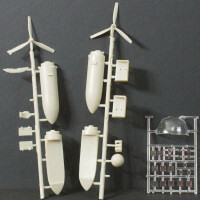 The kit is molded in light gray styrene and presented on five parts trees plus one tree of clear parts. In my kit, the clear tree is put into the same bag with the other parts plus instructions and decals, so expect them to come out a little worse for wear. As with all Mach 2 kits, this kit is a limited production kit so good modeling skills will be required to work with these parts. The instructions are rudimentary at best, so you also had better know your way around the subject to get everything together. I don't have to worry about this aspect since I'm not going to build this model per se. More on this shortly. The kit does build into a respectable model of the C-123 in experienced hands, but you'll see in many of the online build articles the frustrations expressed by those modelers. So why are we looking at this kit? As I mention above, I'm not certain when Roden will have later version of this kit on the market, and the one I wish to build may not be one of those options. I searched the internet and found a sealed copy of the Mach 2 kit at a fraction of its current retail price and I'm considering this an aftermarket detail set. With the help of the parts in this kit, I am going to do the NC-123K so I now have the revised nose, the necessary J85 engine pods, and a few other odds and ends to convert the Roden kit. If you're waiting for Roden to release the C-123K or hoping someone will produce the jet engine pods and/or nose conversion in resin, good luck with that. The Mach 2 kit has been on the market for quite some time and you can find these at decent prices. I now have the parts I need to move forward on my Black Spot project with the better Roden kit as the foundation.